Keep all the ingredients ready. Break the biscuits and powder it coarsely in a blender. Add Cashew nuts and raisins, sugar and vanilla essence. Add cocoa powder, condensed milk and melted butter. After 1 1/2 hours, remove the butter paper and cut the chocolate into rounds as shown above. Enjoy this Christmas 2011 making this easy chocolate recipe with your kids. Have fun! I will soon post another chocolate recipe which involves cooking. Stay tuned. Wow this is so simple and I'm sure it tastes great! WOW!! So easy & yummmmm!!!!!! And u refrigerate the remaining cond milk?? Does it stay good for atleast a week?? I usually try & finish off with 2 days of opening..And so always a bit hesitant to open a can of it if recipes call for it in small amounts..
That's an amazing recipe as there is no baking involved...thanks for sharing. Yummy fudge and what's better it's a no bake. How easy is that? wow...this so easy, no bake....superb recipe...looks wonderful. I simply love this chocolate fudge!!! Yumm!!! For how many days can we store them? 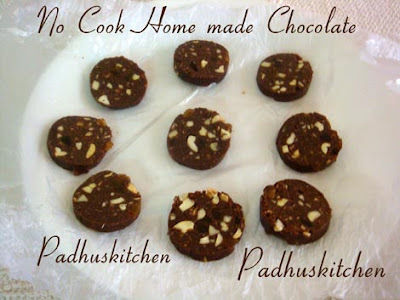 Padhu, can I replace cocoa powder with a good quality cooking chocolate ? You can grate it finely or melt it slightly and add. Thank you for the recipe. I was not able to make the dough like chapati dough. It was not so tight and so not able to make the cylindrical shape. I added milk too and managed somehow to make that. But still while cutting, it has broken. Where did i go wrong? It is a very easy recipe. Milk is not necessary at all for this recipe, but in case if you need, you can add 1 or 2 tsp of milk. You should make a smooth dough. If the dough is not smooth, it tends to break. Thank you. But the fudge tasted excellent! Do we need to roll only in butter sheet? Or normal food roll sheet is also ok and were do we get butter sheet. Want to try this for diwali kindly reply me. It is just parchment paper. You can roll it in aluminium foil also. You can get butter paper in shops which sell baking accessories. Thanks i tried and it turned good.Not able to add pic here. I refer your blog for many recipes and so far what ever i tried turned out good. I tried this recipe it's delicious . Very easy and simple. Hi padhu, is it butter paper s mandatory or can I use Tupperware box? You can use butter paper or aluminium foil. Instead of condensed milk.Can I use regular milk. No. you must use only condensed milk for this recipe. How many days it will be good?